I'm an a2 Milk Ambassador! Milk is a staple at my house. We enjoy milk every day... or at least, my husband and kids do. I've never been a milk drinker, even as a child, and I suspect it was partly because of the way it tasted (we only had evaporated milk in the Philippines at that time!) and party because of the way it made me feel. Coming to live in the US and getting to taste real, fresh milk got rid of my taste aversion, but the possibility of tummy discomfort (yes, lactose intolerance in Asians is not a myth!) has always kept me away from milk... until now. I'm happy to announce that I've been chosen by Influence Central to be an ambassador for a2 Milk®! What's special about a2 Milk®? It's the only milk on the market that is naturally free from the A1 protein, which is the culprit behind "Post-Dairy Digestive Discomfort". It only contains A2-protein (beta-casein), which is found in all other mammals' milk (sheep, goat, even human). Originally, all cows' milk had only the A2-protein, but over time, cows' milk developed the A1-protein due to modern farming methods. However, there are still herds of cows that only produce milk with only the A2-protein, and those are the cows that the a2 Milk Company™ sources its milk from. So it's real cows' milk from a very special herd of cow! There are other brands on the market that offer milk for people with dairy intolerance, but their milk has been chemically altered. 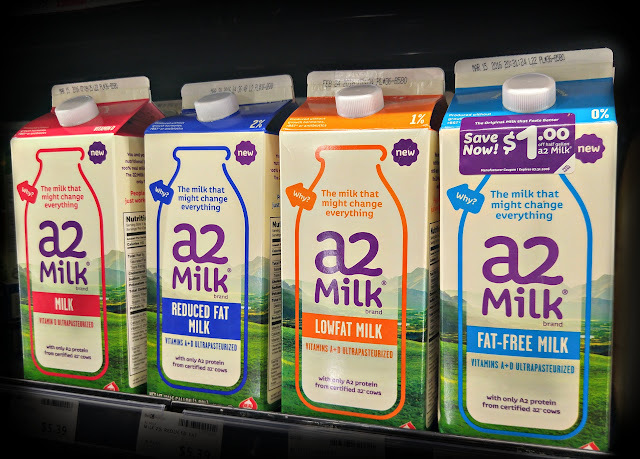 a2 Milk® is all natural, and it tastes just like regular milk because it is regular milk! We just bought some at Whole Foods (click here for a store locator), and my family can definitely vouch for the taste. They can't taste the difference at all! 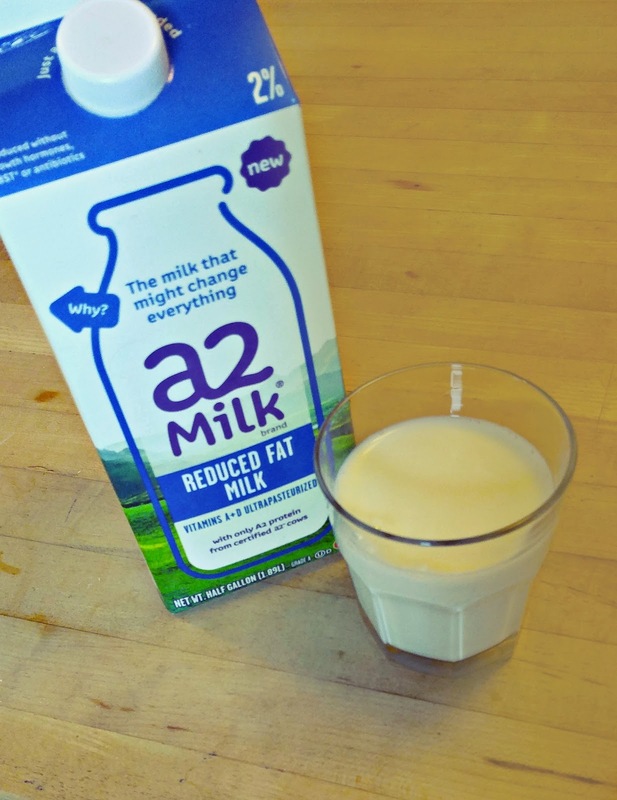 Will a2 Milk® finally help me overcome my aversion to milk? Stay tuned! Tomorrow is the start of our school district's five-day, mid-winter break. Families refer to it as "ski week", but we don't have any plans to ski or travel. We'll be spending it here at home, which means the kids will play with toys, mess up the house, and complain about being bored.... all within the first 2 hours. That scenario will repeat infinitely for the entire break (or at least it will feel like it!). You know the saying: absence makes the heart grow fonder. Move some toys to the attic or garage; every so often, swap them out with toys already in the toy box. Your child will welcome the reappearance of the toys, and won't have time to miss the old toys because they'll be so busy playing with the "new" ones. Help your child get creative with their toys and give them new life. It's okay to disregard the instructions sometimes! Suggest combining toys that normally don't get played with together. The Mousetrap game that everyone is bored with can become an obstacle course for LEGO minifigs. That Hot Wheels race track can become a ski slope for Barbie dolls, and stuffed animals can inhabit a pretend zoo staffed by American Girl dolls. Having a friend over changes the dynamic of play, because friends bring in new ideas... and new toys! Often all that's required for a child to show renewed interest in a toy is to have a friend show interest in the toy as well. Challenge your kids to see if they can survive without toys for a week. Their natural creativity will come to the forefront, and they'll find ways to play with sticks, stones, and snow. Siblings can play hand clap games or hide-and-seek, or put on a play. Ordinary household items can become toys -- think couch forts and pretend kitchens! On your next group playdate, have everyone bring five toys to swap, and have each child pick 5 toys to borrow for a week. 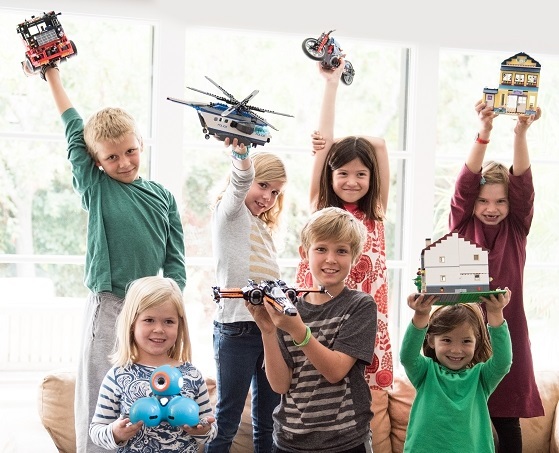 Kids are happy because they get to play with five new toys, and parents are happy because they didn't need to spend anything or make more room in the toy box. Have parents agree on the selection process before hand (to minimize hurt feelings in case everyone wants the same toy), and make sure all toys are properly labeled (so they eventually make their way back to their owners). Have you thought about a toy rental service? I didn't even know such a thing existed until I was introduced to Pley -- and now that I have, I think it's the perfect way to expose your kids to new toys (without the financial commitment) and them interested. It's like Netflix for toys -- sign up at Pley.com, select the monthly subscription plan you want, make a list of the toys your child would like to try out, then sit back and wait until the first set arrives. Keep the toys for as long as your child is interested in them. When your child is ready to try something new, send it back in Pley's pre-paid mailing box, and get the next toy on your list. Your child gets all of the fun without the commitment, clutter, or expense. It's difficult to believe that February is here, and it's even more difficult to believe that registration for many summer camps have already begun! Winter break has barely ended, and here we are, having to plan for summer break, but with all of the popular camps selling out quickly, it's really best to register early and plan early. You can't think about summer camp without thinking of camp labels, so it's never too early to check out Label Daddy. Their Camp Pack collection contains all the labels your child will need for summer camp, and if you only want 1 particular kind of label, you can choose from their wide assortment of labels. They have a label for everything, from pencils to clothes to shoes to luggage tags and more. Label Daddy labels are super durable peel-and-stick washable labels -- they're washer/dryer safe, microwave safe, dishwasher safe and UV resistant! 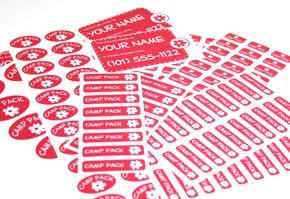 Their exclusive laminated coating gives labels an extra layer of protection and is a must for camp! These labels are made in the USA and shipped directly to you worldwide. 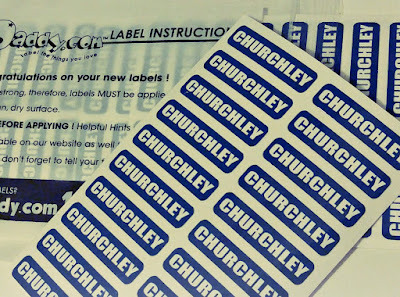 Label Daddy labels are easy to customize online. Pick from tons of colors, sizes and logos, including Disney and Marvel characters, MLB, NBA, and NHL team logos, other sport and fun logos, and more. Preview your labels online, and order with just a few clicks. I recently had the opportunity to order labels and I can't say enough nice things about them. I've been ordering from Label Daddy since 2009 and this latest set of labels exemplifies why I've been a fan for so long. They are so durable, so bright and colorful (this time I chose more generic labels without logos), and they stick to practically anything. These labels are practically a guarantee that your kids' stuff finds its way back home! Disclosure: I received a sample set of labels to review, courtesy of Label Daddy via USFamilyGuide.com. The views and opinions expressed here are my own. Lately, 3Po and Jammy have been obsessed with their mile times. 3Po has gotten his time under 7 minutes, and Jammy's is just above 7, but they are determined to break 6 minutes by the time they move on to high school! They already do a lot of running on their soccer team, but I said that if they really want to see improvements in their mile times, they need to do some interval training, mixing up sprints and some longer distances. 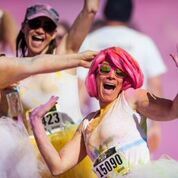 To help motivate them to run, we've made it our goal to sign up for one or more fun runs this year, and the one they are most interested in is the Color Me Rad run, coming to San Jose on March 12. Miracle of miracles, they don't have any soccer games scheduled that weekend, so it looks like Color Me Rad is a go!! They are so excited about the prospect of getting showered in color from head to toe as they run. It certainly makes every single kilometer an interesting experience! I think this is a great first run for anyone, any age, and any fitness level. The 5k distance is totally doable, and there will be so much going on, the run will be over before we even know it! General registration is $35 ($40 after Feb 5), and it includes a race T-Shirt, RAD tattoo, a color pack, and a free Goo Guard phone case! Kids under 7 can run for free, but if you want your child to have their own shirt and color pack, it will cost $15. 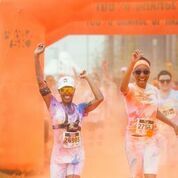 Pricing increases on February 5, so sign up now at https://secure.colormerad.com/affiliate/USFamilyGuide/event/sanjose . Hope to see you there!! Disclosure: I am receiving complimentary registration to Color Me Rad, courtesy of US Family Guide and Color Me Rad. The views and opinions expressed here are my own.